We can only wander how many pet turtles have lost their happy homes because their owners mistakenly thought they needed more space. We appreciate the thinking of these turtle owners, but our turtles have set us straight. If only more people would listen to their turtles. Space is seldom a problem. We will begin by describing the spaces Emily, our large Florida red-bellied turtle, enjoys. She enjoys more total space than any of our other turtles. As you read this account, keep in mind that it is not the spaces she enjoys that matters. It is her decisions to use them. Pay attention! Florida red-bellied turtles are found naturally only in Florida and southern Georgia. They are large warm climate water turtles. Emily lives in Pennsylvania where winters are cold with months of snow and ice. In Florida these turtles may brumate but not hibernate. We are not prepared to subject Emily to months of hibernation so she comes inside for the winter. But where do we put an eight pound, 11" carapace length turtle. She gets the run of the house. Like most turtles Emily looses her appetite in fall and prepares for a winter sleep or at least low activity. Our water turtles are brought inside before we have frost. Emily is placed in her 30 gallon aquarium and the other water turtles are placed in the basement for hibernation. Okay she is not given a choice, but she cooperates. There is a short period of adjustment. It is not the eating schedule that needs adjustment; it is the pooping schedule. Emily is placed in a utility sink to eat where she also poops. She must poop before she is placed on the floor to run the house. After she is adjusted and on the floor she goes where she wants which is usually in one of the bedrooms. Our house is a typical one level three bedroom ranch. If she does not indicate she is ready sooner, she is placed in the sink to eat and drink about every third day. She will remain in the sink until she indicates she is ready to come out. How does she indicate she wants out? She simply thumps about to get attention. If she has pooped she is dried with an old bath towel and placed on the floor. If she has not pooped, the water is drained and she continues to thump. Usually this causes her to poop. Then after she is cleaned she is good to go. If Emily wants in the sink, she simply goes to it and waits. Often she comes out in the morning while we are preparing to go to work. We leave at 6 a.m. which is really early for a turtle in the middle of winter. When she does come out she is placed in the sink with water and food before we leave. The lights are turned off. She knows she is in the sink for the day. Usually she will quietly spend several days in the sink with several feedings and water changes. Emily seldom goes into the bedroom that is now a turtle room where her aquarium is located. Some days she will come in while other turtles are being cared for. If she sits below the aquarium or places her foot on my foot, she is placed in her aquarium. Usually she will remain in it for a day or two until she thumps to get out or is moved to the sink to eat. She may receive lettuce in the aquarium. This is Emily's routine until spring. There are two sliding glass doors she has access to, one looks out over her summer pond and pen. She does not go near them until it is time to go outside for the summer. Her timing is usually within a day or two from the date of the previous year. One year she was on time, but the weather was cold and the turtles did no go out for another two weeks. The day the pond was filled and the turtles were brought out of the basement, Emily was placed outside with them. She was not happy. She climbed at the fence insisting she be allowed out. When placed in front of the fence she moved to the house and was helped onto the deck. She moved to the door and was let inside. She immediately returned to a favorite place under a bed. We just smiled. The next morning Emily was waiting in the kitchen ready to go outside. She just had to be the one to decide when she would go outside. When placed outside in the spring Emily will not stay in the pond. She moves to the leaf pile where box turtles may still be hibernating. She digs in for four to six weeks of sleep. She will not be happy in the pond until her favorite bog plants are ready for her to eat. Read more about Emily's decision making and antics in Tour 3: Keeping Records on Your Turtles on the Backyard Turtles page. Generally Emily is content in her pond in a very large pen. She may need to check out the house once in a while during the summer, but not to stay inside. While the pond is small, the pen is 46 feet across. She has room to roam. If she gets upset with something (usually me), she may retire to the leaf pile for a day or two. So Emily has more living space than most apartment dwellers. But what is important is not the spaces, it is her freedom to choose where she will be most of the time. She chooses to be in a utility sink and a 30 gallon aquarium. We believe it works because she has trained us to let her out when she wants out. But it does not stop there. For the first few years Emily was with us she had another activity area she used but not by choice. She made public appearances with the wildlife rescue organization who brought her to us. She is a crowd pleaser who always drew more attention than the birds they typically liked to show. After a day in public Emily seemed much more content back home in her pond with her hard shelled friends. We use a 50 gallon Rubbermaid stock tank as a temporary holding tank for turtles when needed. Emily is so noisy that she will want to go see what is happening in it. She will even quietly spend a few days in it with other turtles. Read more about this in Tour 6: Introducing New Turtles on the Backyard Turtles page. So now you are thinking that you can not possibly give your turtles nearly enough space yee of little faith. Read on, read on. The first snapping turtle we ever raised was named "Turtle". We have written about him before. He spent several years in a regular high 30 gallon aquarium. Then we went all out and purchased a 125 gallon aquarium just for him. Both were nicely furnished. He could easily climb out of the tanks but almost never did. We could say he had the run of the house too. He was taken out for walks which became less frequent as he grew larger. Many years later we raised another snapping turtle in the same 30 gallon aquarium. We no longer had the 125 gallon aquarium. This time it was the turtle, water, and an external filter. There were no decorations. He was happy and only climbed out once. We could also say he had the run of the house. He was given infrequent walks. So where are we going with all these stories. Field researchers like to study the "home ranges" of turtles. A home range may be a stretch of river or part of a lake where a water turtle lives. Land turtles are often described as having more than one home range that they move between. They also describe them as having additional places for hibernating and nesting. We would describe them as having one home range with distinct activity areas they move between. Do you see where this is going. Domesticated turtles have activity areas. They may have many activity areas with one being where they spend most of their time. Being handled could be described as an activity area. Most pet turtles have more than one activity area. Something else we have learned. If we do not want an area to be a turtle's activity area, we never introduce them to it. This is similar to training a dog not to get on furniture. You can't invite a dog onto the furniture with you breaking the rule and then expect the dog to understand it was only a one time thing. We have a second large pen, The Court Yard Garden Turtle Pen, Emily is not given access to. Some turtles are moved from one pen to the other pen. Some indicate they want to be moved to the other pen. If Emily becomes familiar with the other pen and likes it, she will insist on visiting it. But the second pen has no pond. She would trample all the plants. There is also a bog garden outside her pen which she has gotten a glimpse of. She is so smart and head strong that we must be careful not to start things with her we do not wish to repeat. So before you reach a conclusion that your turtle needs more space than you can give it, access the activity areas your turtle gets to use however infrequent. Does it get time on the floor or in the yard? Do you handle it often? Do you feed it in a separate container? Is it cared for in another home while you are traveling? Do you give it soaks in a bowl of water? If you determine it does not have enough activity areas, can you add activity areas? Stop thinking of that aquarium as its only space if it spends time outside of it. Sure a bigger aquarium sounds better. We hear from people who have to move their unhappy turtles back to their old aquariums when they do not like their new larger aquariums. But don't think one or the other. Think two activity areas and begin using them. Transition your turtles to the new aquarium. It is different when they realize there are two areas. So we still have not said how much space a turtle needs. And what about several turtles housed together. Read on. I once took issue with the educational director of an environmental center who was quoted in a newspaper article promoting an expo at a zoo where Emily was scheduled to appear. She was quoted as saying that non-native red-eared sliders displace native painted turtles; she said they take all the basking sites and nesting sites. When I saw her at the expo I asked her where she learned it. She said she read it on the internet. I told her she was wrong on all accounts. She asked me where I learned it. I said I look out my window and learn from my turtles. Here are a few pictures of our turtles basking together as one big happy family. It is not uncommon for me to look out and see just two turtles basking, one on top of the other. 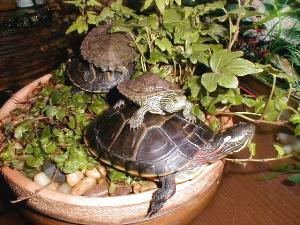 It will often be a painted turtle on top. Painted turtles are rather high spirited and red-eared sliders are laid back. And the earth is too large for turtles to run out of basking sites and nesting sites. The point is that having two turtles does not necessarily mean you need twice as much space. Check these turtles out. For discussion purposes lets think of keeping turtles as pets as a hobby. Then the spaces we provide for them in the way of aquariums, vivariums, ponds, and pens are also our hobby areas, our play areas. Part of our hobby is creating environments for the turtles. Turtles may have high impact on the environments we create for them. They also have needs that we must provide for if they are to have some measure of independent living, something less than constant daily care. Therefore, the smaller the space or fewer spaces we provide, the more constant care we must give them. Do you get the picture now. The amount of space a turtle needs is directly related to the amount of daily care and attention we are willing to give them. Obviously we love our turtles, but it is also nice to have a break when they hibernate. The turtles inside for the winter don't require as much care since their appetites and activity levels are reduced. Baby turtles are as much work in winter requiring daily care. Okay but how much space do they need or what size aquariums do we recommend. We use only two sizes of aquariums for either aquariums or vivariums. We use the 20 long aquariums and the 30 gallon breeder aquariums. We also have an acrylic vivarium 48" by 24" by 12" high. Even Emily's 30 gallon breeder tank is only filled two thirds full of water. But these are temporary quarters for winter use or for young turtles. Larger aquariums or more aquariums are as much the hobby side of the keeping of turtles. Bigger spaces give us more room to landscape and play in. But a turtle you really cherish does not have to have more space to be happy and healthy. Never give up a cherished pet turtle because you feel you do not have enough space. It doesn't cost anything except time to take it for a walk. It is common knowledge that dogs establish territories and defend them. But a dog is not loyal to its house or territory. If the family moves, the dog may be the first one in the family automobile and it will never look back. It is the dog's family that matters and not where they live. We find that domesticated pet turtles bond with the family not the spaces. We think that these domesticated turtles become comfortable with their families and depend on them for their needs rather than their spaces. Wild turtles need to know their home ranges to survive; domesticated turtles do not. We will cover outdoors spaces in separate tours. There is so much we hope to cover. For this tour we want to leave you with one last parting thought. Think of yourself as your turtle's space rather than the container that houses it most of the time. You! Your time and attention. Not some glass box. That's what our turtles tell us. We hope you enjoyed our twenty-second tour and we hope we have conveyed the message of our hard shelled staff to you correctly.